Many pets become very anxious about noise when their owners are out, especially when the fireworks begin. If left alone, pets can funnel their anxiety into destruction—including vocalizing, digging and chewing—or even run away. While calming products like pheromones, sedatives, and Thundershirts can provide some relief for stressed pets, the ideal solution is to simply stay home. If your pet is stressed out or anxious, he/she should not be left alone. If you must be away from home, never leave your pet outside. Dogs often have no problem breaking through fences or other outdoor enclosures when scared, and in fact, hundreds of dogs go missing every year on this holiday. Identification is also crucial. In the event you do lose a furry friend in the festivities, you’ll have a much better chance at finding your pet if he/she is properly identified with tags or a microchip. Throughout the summer, your veterinary team will generally see one to two serious gastrointestinal cases per month from dogs "cleaning up" around the BBQ guests. Veterinarians have had to surgically remove champagne corks, wooden skewers, bones and corn cobs from these animals’ intestines. Even rocks can become irresistible to dogs if they’re covered in drippings. Pets should also be kept on a normal diet. Any change, even for one meal, can give your pet severe indigestion, including vomiting and diarrhea. This is particularly true for older animals with more delicate digestive systems and nutritional requirements. Keep in mind that foods such as onions, chocolate, avocados, and grapes are all toxic to pets as well. 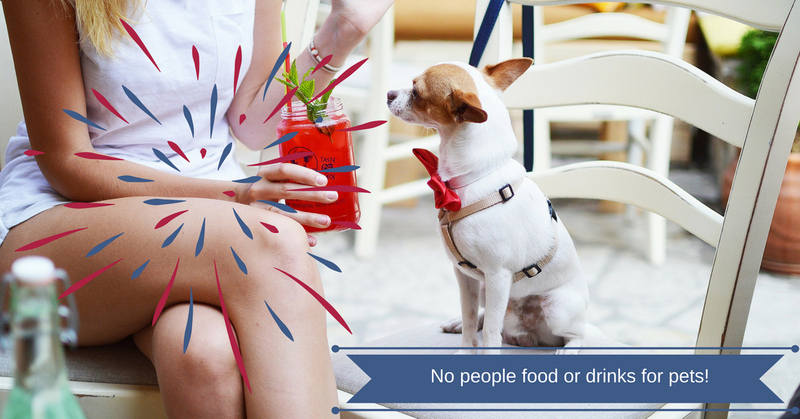 Alcoholic beverages have the potential to poison pets. If ingested, the animal could become very intoxicated, weak, depressed or may even go into a coma. Respiratory failure and death are also possibilities in extreme cases. Heat stroke is a deadly condition veterinarians see every summer. It is most commonly caused when an owner leaves his/her pet unattended in a parked vehicle. Not only is this act illegal, but on a sunny day, it is also dangerous more quickly than you may think. It can take only minutes for the temperature inside a car to rise to a lethal level. During warm weather, the inside of a car can easily reach up to 120 degrees, even parked in the shade with the windows down. Remember, it only takes a brief amount of time for animals to get into serious trouble when exposed to high temperatures. Heat stroke can also occur with strenuous exercise during the hottest time of the day or even if a pet is kept outdoors without access to shade. Dogs with short muzzles, like pugs, boxers and Boston terriers, and dogs with heavy coats are especially at risk. Other predisposing risks include obesity, underlying heart disease, and upper airway disorders. Indoor cats are only protected from the heat if the temperature inside is kept cool. 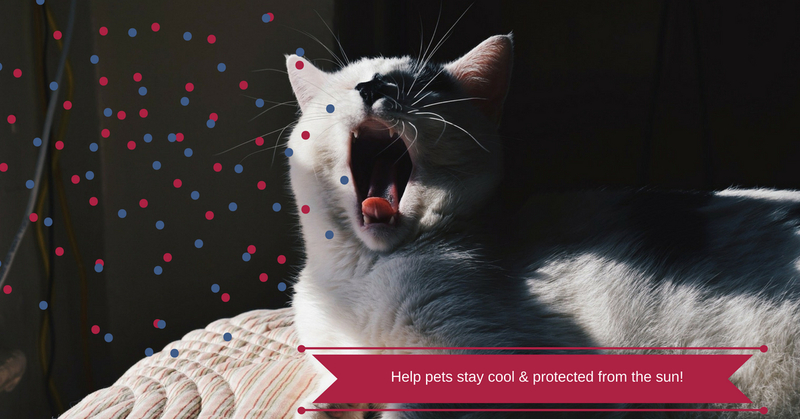 In an effort to save money and energy, many pet owners turn off the air conditioning when they are out of the house. Because rising temperatures outside can also affect the indoor climate, this can be a very dangerous situation. Ingestion of sunscreen products can result in drooling, vomiting, diarrhea, excessive thirst and lethargy. The misuse of insect repellent that contains DEET can lead to neurological problems. While the luminescent substance in these products is not highly toxic, excessive drooling and gastrointestinal irritation could still result from ingestion. Intestinal blockage could also occur from swallowing large pieces of plastic. Maybe the most important tip is to have fun this Independence Day! To make sure that your holiday plans are pet-safe, please feel free to contact us!